Here they are! in all their glory – the complete, filmed primary colours of story. 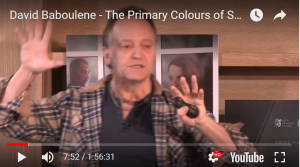 Filmed live in London in April 2018, the seminar is around four hours of theory, practical advise, clips and short films. Give it a go, and learn a lifetime of story expertise in just a few hours! Click the button for access to the entire seminar for £30. Do not click away from the payment process! It automatically redirects you to the seminar. Do not click away from the payment process! Follow it through to ensure you are directed to the correct page. Once you have the seminar, do please save the web page as a favourite so you can return at any time. NOTE the links you are invited to use in the seminars are on the Clips and Data page of this website. Thank you for your support. Any problems, do get in touch via the Contact page.